Sometimes loss opens your eyes to its counterpart, and there is something to gain. Sometimes we are preoccupied with all that is missing, all that is wrong, and everything that isn’t as beautiful as we wish. Recently, I have gone through something very difficult, and I have felt that the world was a very dark and alienating place. I used to be an optimist, and I still like to think I retain some characteristics of an optimist, but I am no longer the same person I was a few months back. I am aware that we are always evolving, always changing, and we don’t actually remain untouched, untainted and unchanged by the world. I began to fear that as I was starting to physically deteriorate, I would no longer find happiness and/or beauty anywhere. When reality hits, your views on life, love, and even friendships are shaken. But then I had that moment, as I always do. That one moment, where one missing piece of the puzzle finds its way into your brain, and you realize that there is more in front of you than you could have ever understood. One day, as I was on the couch, feeling physically dead, and nonchalant, that missing puzzle piece spoke to me, and she whispered, “You are an Assistant Professor of literature now. Do you understand what that means?” She asked me why I was so numb, why I didn’t seem to embrace my happy moment. Once a dream, now my reality… this was now a part of my identity – academic identity, at least. The point where numbness and raw emotion meet, the point where they collide, that exact second when someone’s genuine love jolts your senses – something suddenly aches. I realized that it was a deep place within me, an ache that was more grateful than painful, grateful that there was depth somewhere, and I had been touched by it. I had been so alienated from the world, from myself, that I struggled to find meaning and beauty anywhere. But my missing piece reminded me. I think we all have these pieces, floating around, just waiting for us to reach out and claim them. I think I’ll be ending all my personal posts with this: and that’s all for now. I was eighteen years old when my neurologist informed me that I would never be able to do anything that my peers would. I was told that I shouldn’t compare myself to people my age, that I was now dealing with a chronic illness, and that I would have to adjust my life and brain settings to accept loss. Losing one’s senses is terrifying. Losing the ability to walk, to see, to hear, to feel – to name a few examples – leaves you very afraid of the future. The uncertainty that comes with living with MS, an unstable and very random disease, can diminish any sense of security that we tend to take for granted. For the past 12 years, the minute I open my eyes in the morning, I look up at the ceiling and realize I’m still here, I can see, and that my legs are functional today. But I digress. Even though living with MS has been quite scary, it has also given me the desire to live life to the fullest, to live in the moment, in that moment where everything is okay, I am still here, I am still feeling like myself (or the closest version to my old self). So in 2014, I finally earned my PhD in English Literature. People have congratulated me, as they always do with any success. But I do not feel that being academically successful has been my goal. I merely wanted a chance at pursuing a dream, a goal, and a sense of identity. My PhD is not just academic success, it is a personal one. When I had my Viva, like all other PhD students, I was scared and tense. I was not sure if I could answer the examiners’ questions, if I could prove that my work was good enough, and if I was capable of establishing ‘new grounds’ for academic research. What was worse though, I was not sure if I could handle hours of an oral examination without my body (and brain) shutting down. I informed the examiners and the Disability Office ahead of time that I would require a break. Because I suffer from extreme fatigue, my body chooses to start shutting down at the worst and most unexpected times. And that was exactly what happened during the defense. After about half an hour, I was starting to see blurry examiners, my speech slurred, and my hand announced its tremor. My body needed to rest, to sleep, as soon as possible. And yet there was no escape. I had to keep going, and when the main examiner noticed that I was not feeling well, he asked me if I was okay. Now, if you know me at all, you would know how difficult it is for me to say “No, I’m not.” I despise having to do that, to admit defeat, especially at times where I really have to be okay. I was given a five minute break. I stepped outside, took a deep breath, and started stretching. Stretching my muscles helps relieve some of the spasticity. Of course I looked very silly, I am certain, and the examiner was surprised to see that that was my idea of a break, rather than a bathroom break. Finally, after hours of going through the endless sections of the thesis, I was informed that I was now Dr. Shahd Alshammari, and that I had passed without any corrections. The external examiner commented that both examiners had noticed how tired I was, and said “despite your deteriorating health, you did well.” After the viva, my body crashed for a week. And today I am writing this post, months later, realizing that it was never about academic success. It was never about the degree. It was always about life. It was about a chance. Just a chance, a chance to be, to become. I am no longer that eighteen year old who was told to be realistic, that my disease was progressive. I am now a twenty-eight year old who believes my disease is progressive, and being realistic means living despite reality. Sometimes it just takes a bit of dreaming, a dose of optimism perhaps, a belief that there is always that one percent that life can give you a chance, a shot at being. I have realized that it was really never about the destination, and that it has always been all about the journey. I got to travel – and go places, and that has defined my life in endless ways. 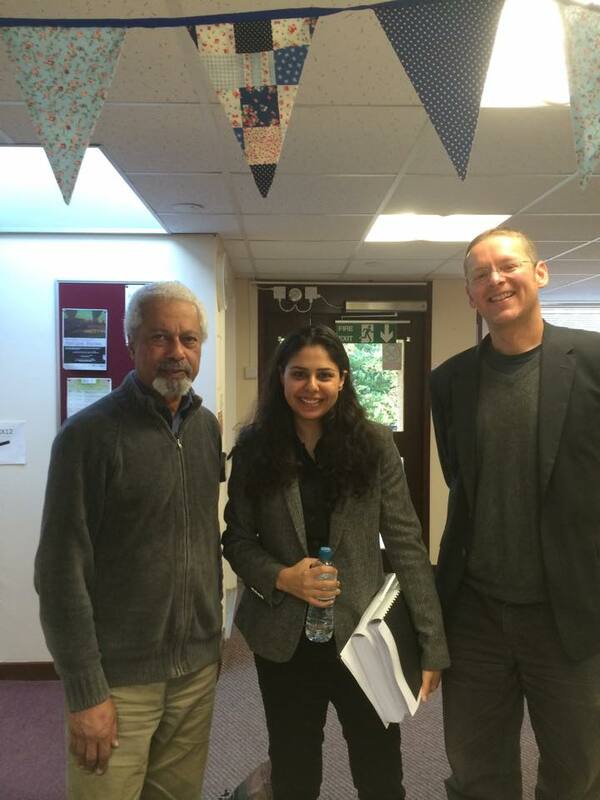 Below is the photo I insisted on taking with Professor Abdulrazak, Head of Department at Kent, and Dr. James Watt, of Cambridge. ‘I fell in love once, if love be that cruelty which takes us straight to the gates of Paradise only to remind us they are closed forever.’ Jeanette Winterson.